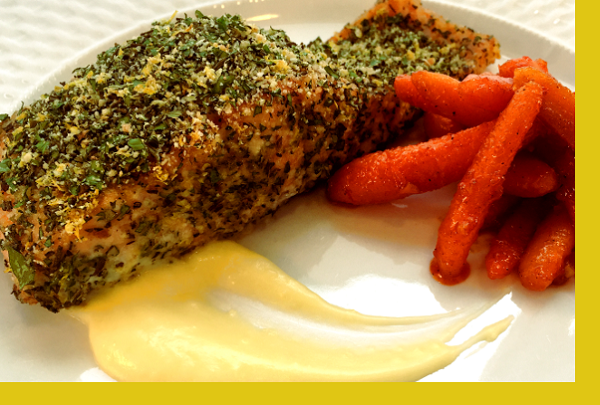 Herb crusted salmon with lemon aioli served together with Harissa glazed roasted carrots. Fast & hassle free from kitchen to delicious. The salmon was excellent and so were the carrots. I did not like the aioli. Would have preferred a lemon, dill type sauce.it was all so easy to prepare. Mom and Dad said it was excellent! Easy to prepare with excellent flavor! this is another great addition to the salmon offerings. These are always my favorites and this one didn't disappoint. 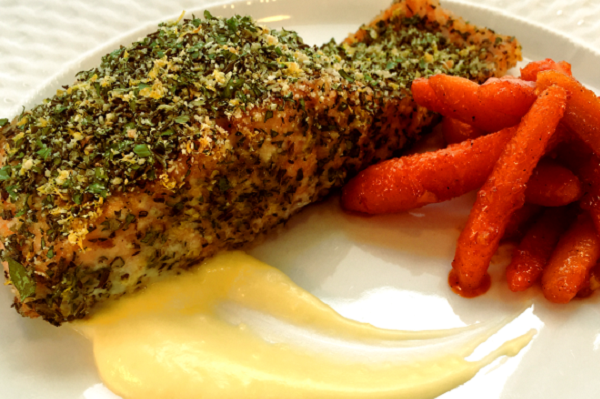 The lemon aioli was a perfect sauce to enhance the flavor. Very nicely done fish. Enjoyed the toppings. We saved the carrots for another night as I didn't think they went well with fish so we had spinach instead. Overall excellent! A delicious new addition to the menue! The fish was very well spiced, and we loved the roasted carrots that came with it. It will be on our regular monthly orders. Thank you Maria.